We left off with a preview of the prep and painting we tackled in our kitchen, back hallway and connected guest bathroom. 1. 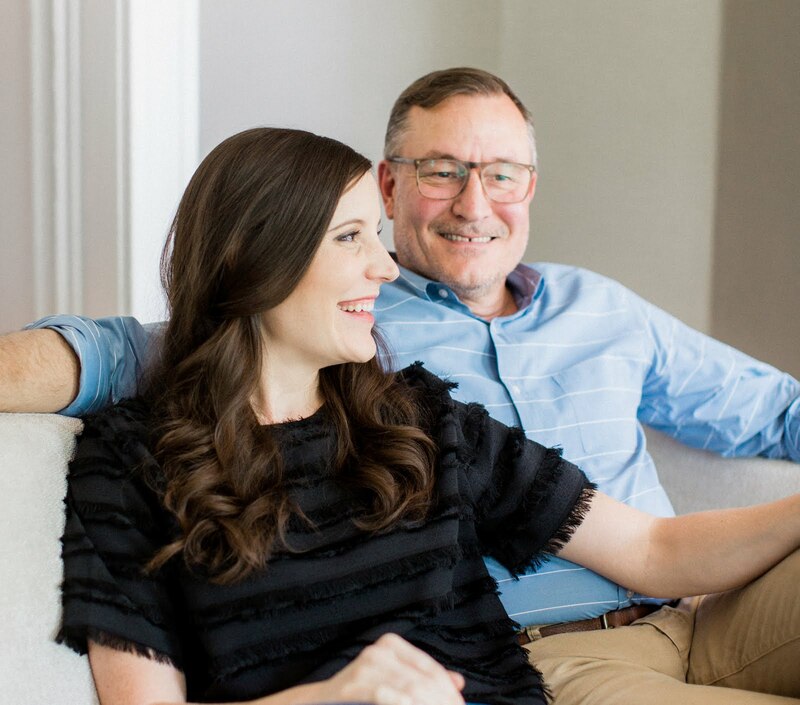 In our old house, we had a small wall nook painted in black chalkboard paint where we kept a running grocery list and let all the children who came by leave us a little message — it was fun to have and we always knew we wanted to have a similar area in our new home at some point. 2. 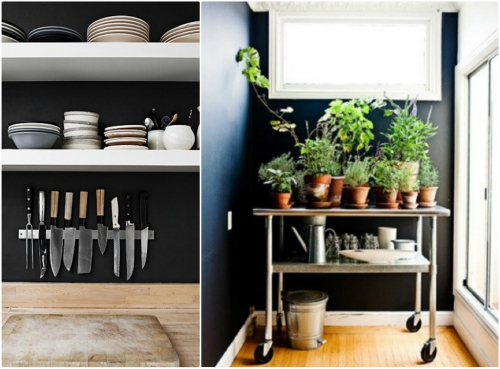 When we put up the gray swatch vote for our peers to help us choose how to paint the kitchen, we had more than a couple suggestions roll in (pun intended) for painting the cabinet side of our kitchen wall in a darker accent color — this really got our wheels spinning. 3. 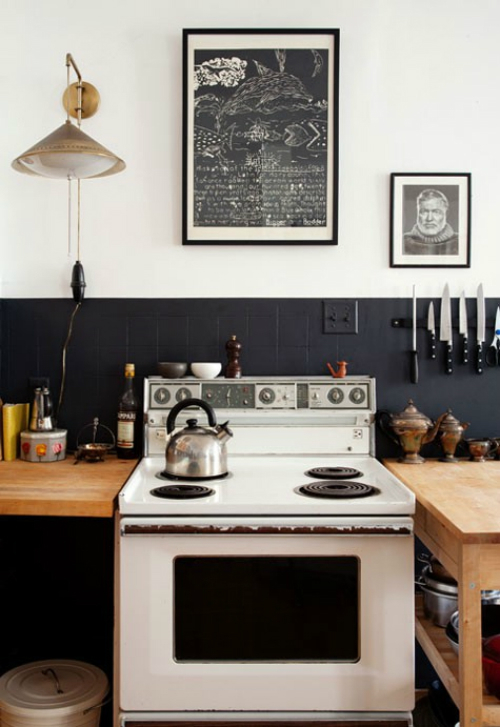 Finally, seeing so many chalkboard & black walls "done right" popping up all over Pinterest, gave us the needed to push to just go for it in a big way — we could always paint back over it if we majorly failed, right? 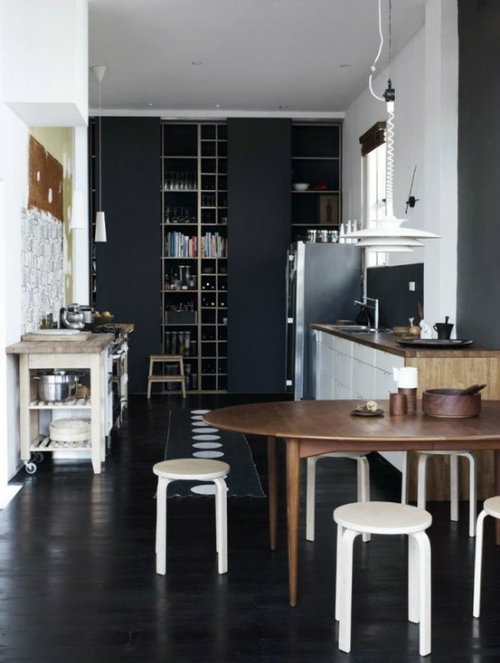 All of the above images can be found with their original sources in my Home Inspiration Pinterest Board. We're hoping for a bold accent wall that's still clean and a little fresh, if that makes sense — not overbearingly black dungeony walls. 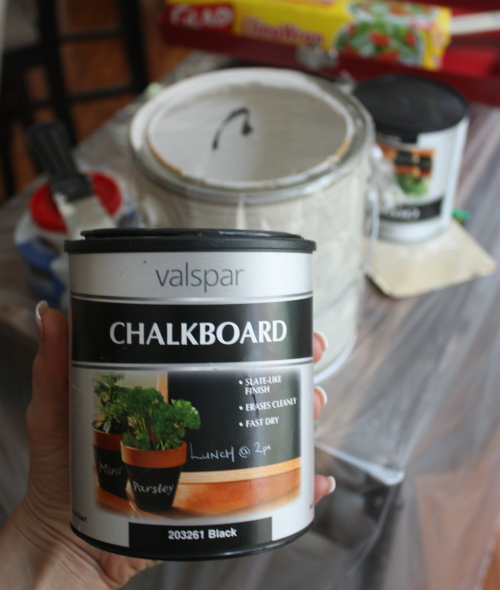 We went with a quart sized can of Valspar Interior Chalkboard Paint we picked up from Lowe's — you can find different versions of chalkboard paint at your local hardware store, craft store or online. 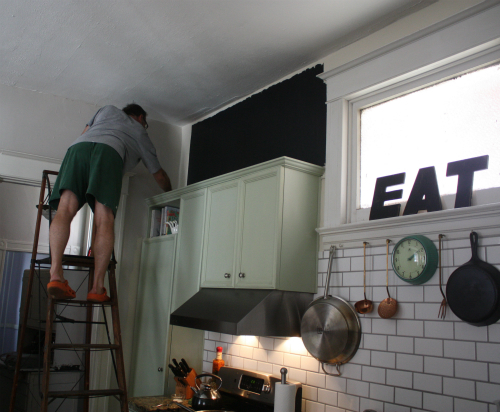 We've also been seeing different tutorials crop up for making your own DIY chalkboard paint in any color you choose which also seems like a fun project to try. 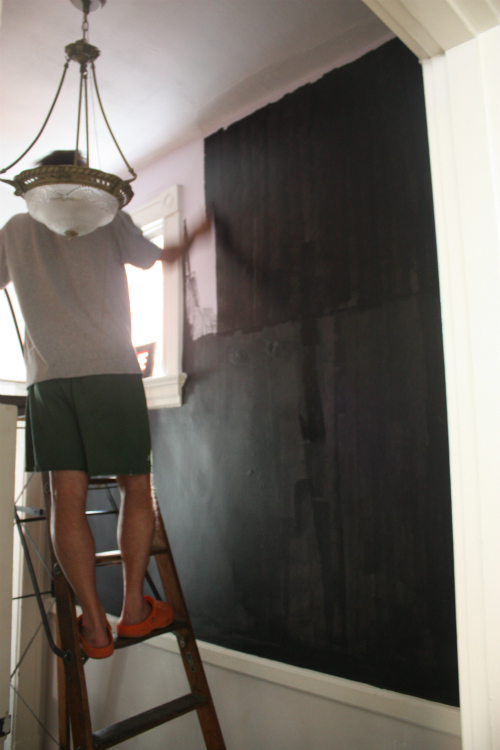 Once we knew we wanted to try some large-scale accent walls in chalkboard paint, we decided on the the upper section of wall above our kitchen cabinets and the upper wall above the chair-railing in our back hallway. 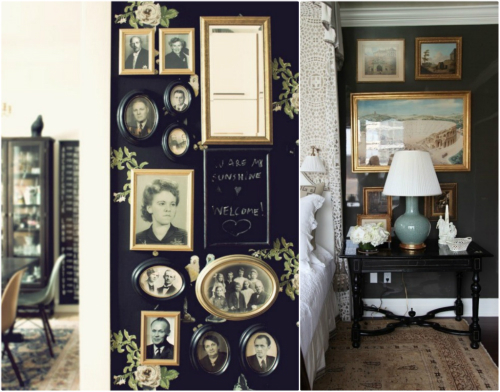 Both of these sections are on the same portion of wall in their respective rooms, so this was just another way we hoped to visually tie all 3 rooms together. I'm not sure why, but Tim swears by this little 3 inch paint roller when painting with chalkboard paint. I'm not going to question it, especially since he did all of that rolling! I'm more of a free-hand edge kind of gal — to be honest, using painter's tape has only led to major mistakes on my part in the past that weren't pretty, so I just try to take my time and be super careful. 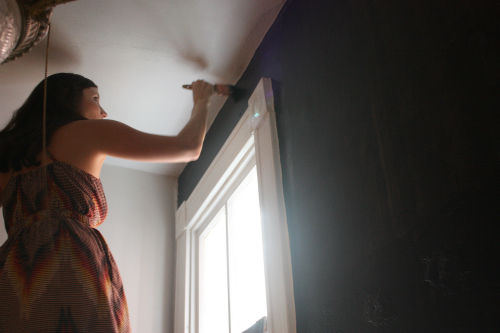 I will admit that edging with the black chalkboard paint was really scary and actually kind-of stressful. With the lighter paints we've been using, it's been easier but as soon as that dark as dark hue went up on the wall, I suddenly felt as though any mistake I made would be magnified x10. I just continued to take it really slow and in small crevices or areas where I felt like I couldn't reach with the regular edging brush, I actually used a small art brush from my old collection of paintbrushes I had when I was in Art School — this was a big help in those smaller areas and gave me much more control over the paint coverage. 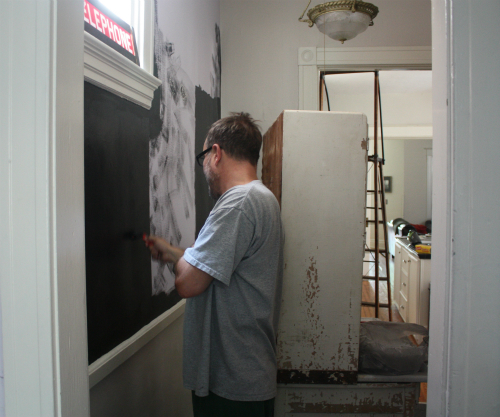 We ended up being able to paint both accent walls in our kitchen above the cabinets and above the chair-railing in our back hallway with 2 thick coats using one quart of the chalkboard paint. So our painting adventure continues — we'll be back next time with the final outcome! 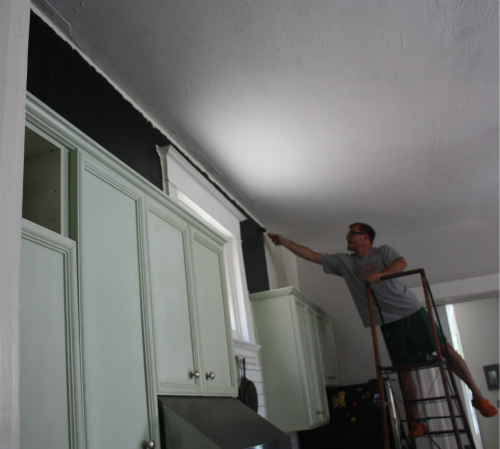 Find the full details on how we prepped and began painting all the other walls in these rooms with a light shade of gray in this post. Guess What!? 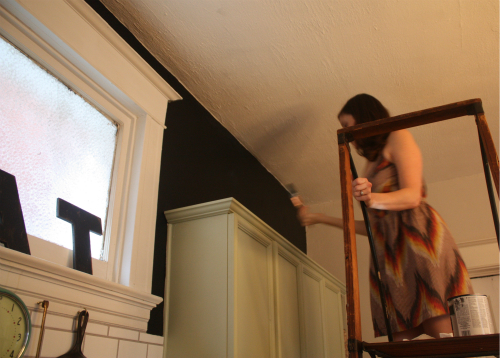 We finished the painting — find the full reveal post with final photos of the paint in this post. I think it looks great so far!!! 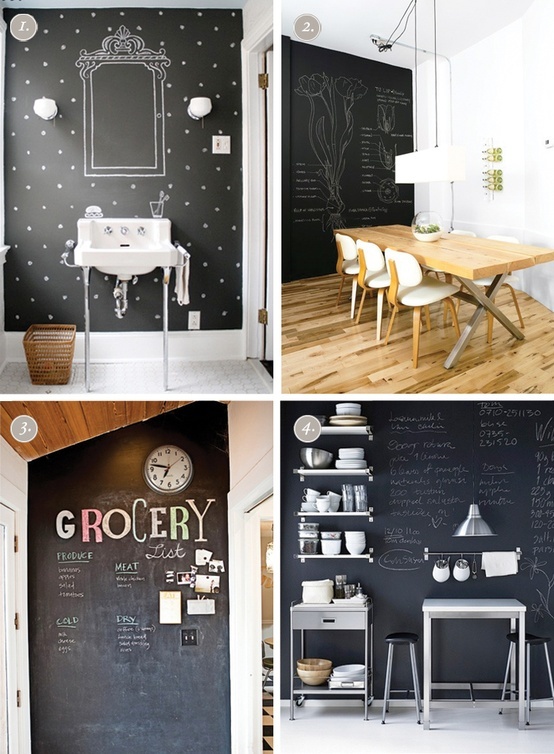 There are so many possibilities with chalk board paint. Think of all the fun things you can draw! Thanks Angie and we do indeed have a couple of ideas! How fun! 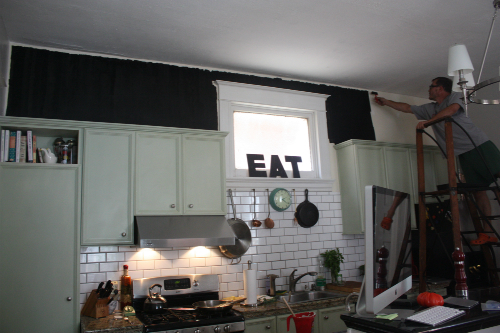 I've always loved seeing kitchens with chalkboard paint, can't wait to see the finished kitchen! losammon, we should have the finished post up Monday afternoon or Tuesday. Thanks for hanging in there and reading the stages so far! Didn't see the supervisor in any of your pix, so assume he was either on vacation or super confident in your capability to get the job done...ditto for the paint visor...looking good! Basil was indeed around and as a matter of fact lost his favorite ball once he dropped it in the paint pan! He is still kicking himself! You go guys! I've been loving the black wall idea, too and why not just do it in chalkboard paint? Think I'm gonna go for it. Also, if you feel like giving painters tape another chance.. I always apply it directly onto the ceiling around the wall - saves me so much time in touch ups. :) Can't wait for the full reveal! Thanks Christa for the tip and stopping by! 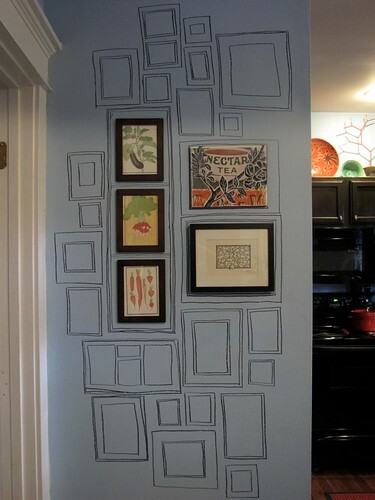 I just saw an idea in saucydwelling's on live journal that would be so fun with a chalk wall. Nicoletta, how stinking cool is that! Love it. Wow! This is looks fantastic. Great job!